Goals: Bodybuilding, Boost energy, Enhance performance, Enhance recovery, Improve sport performance, Improve workout, Increase muscle mass, Maximize endurance, Prepare contests. IBCAA is a branched-chain amino acid formula that dissolves immediately and completely in water. ATP has sourced the highest quality and most pure form of BCAAs. 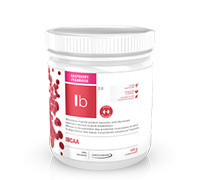 IBCAA boasts greater absorption rates and is faster and more efficient than other BCAA formulas on the market. Non-medicinal ingredients: Natural raspberry flavor, Organic stevia, Citric acid. Recommended use: The essential amino acids L-leucine, L-valine, and L-isoleucine are involved in protein synthesis. Provides essential amino acids for the maintenance of good health. Recommended dose: Adults: Take 1 serving (10 g) two times per day. Mix into 2 cups of water, juice or your favorite drink.